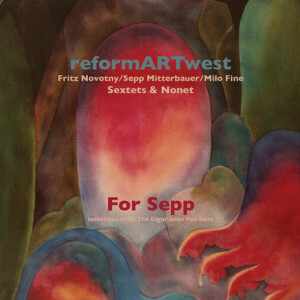 The recently released Nero’s Neptune LP “FOR SEPP (SELECTIONS FROM THE EDGAR ALLAN POE SUITE)“ by reformARTwest, curated by Mark Trehus, features sextet and nonet material culled from the recently released limited edition triple CD set. My mid-to-late May 2016 trip to Germany and Austria was made possible by Chad Popple, who managed to secure funding to bring me to Hamburg. (An overview of our relationship can be found in the tenth question of this recent interview.) When Chad asked if there was someone else I’d like to collaborate with, I immediately thought of Andrew Lafkas, a friend and colleague who moved from Minneapolis to New York a decade ago, and recently relocated to Berlin. Thus, the pair of wonderful concerts (and an internet radio appearance) in Hamburg featured a most welcome reunion with Andrew as well as my long-overdue first public appearances with Chad. And, as I have no idea when I will be returning to Europe, I took the opportunity to revisit Vienna, and, thanks to reformARTmusic spiritus rector Fritz Novotny, participated in 2 splendid concerts under the reformARTclassic and reformARTwest banners, along with 2 days of recordings sessions with small groupings of the reformARTorchestra for the follow-up book/CD to “Wiener U-Bahn-Kunst” and/or a separate “Improcomposer Opera” LP. (Of particular import for me was the opportunity to meet and collaborate with bassoonist Alaeddin Adlernest, whose connection with the Reform Art Unit dates back to the 70s, and pianist Inge Katharina [nee Richard] Pechoc, whose work in free jazz/improvised music actually pre-dates the rAu.) My deep gratitude to Chad, Andrew, and Fritz (along with his companion Margit and friend Siegerl) who had my back every step of the way. These events, and the lovely people I got re-acquinated with as well as those I met for the first time (one person in particular; you know who you are [smile]), made this a fantastic trip which, barring senility, an injury or aneurism, will be an abiding memory.